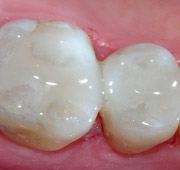 Many patients have had cavities restored using amalgam fillings. While they are extremely durable and a cost effective option in many cases, they have few drawbacks. They are esthetically displeasing, sometimes require healthy enamel to be removed while being placed, and the metal itself can make a tooth more sensitive. This is why, at Cochell Family Dentistry, we offer tooth-colored fillings as an esthetic alternative to the traditional amalgam. This allows us to both repair the teeth and preserve their appearance at the same time. Tooth-colored fillings are made of a composite resin, which, as you might have guessed, comes in several natural shades that enable us to match it to a patient’s specific tooth color. This makes the filling practically invisible within the mouth. Plus, it’s able to bond directly to enamel, so our dentists don’t have to remove any healthy tissue for it to stay in place, ensuring the longevity of the tooth. It’s also metal-free, meaning a patient will experience little to no increase in temperature sensitivity. We can take care of a cavity with this solution in just one easy appointment, and to schedule one, all you need to do is contact us today.